The word "Australia" conjures thoughts of vast open Outback filled with strange and beautiful plants and animals, and all of it flanked by thousands of miles of gorgeous coastline. Such natural gems need protection. InterExchange connects U.S. citizens with international group conservation efforts throughout Australia. To shed a little light on what's happening out there, our partner Conservation Volunteers chimes in. InterExchange: What would you say is your single most significant contribution to conservation in Australia? Conservation Volunteers: It’s hard to choose one – we’re proud of planting millions of trees, clearing vast amounts of weeds, and our work with critically endangered species like the Eastern Barred Bandicoot as we help them move back to more stable population numbers. "We’ll only ever achieve significant environmental change and care for the environment when people want that to happen." Probably our biggest single achievement is involving hundreds of thousands of people as volunteers over the years. We’ll only ever achieve significant environmental change and care for the environment when people want that to happen. Getting them to pull on their gloves and boots and do something practical is a clear demonstration of their commitment and love for the environment, and we provide a focused and highly effective way for them to make a contribution. InterExchange: What is the biggest challenge that you have faced so far in conservation in Australia? Conservation Volunteers: We’re a very large land mass with a relatively small population – so getting enough people to join us is always a challenge, particularly in regional or remote areas. This is where support from organisations like InterExchange is invaluable, because of the international volunteers who commit significant time during their travels to carry out conservation projects with us. InterExchange: What have been the wider environmental benefits of the work that you are doing? 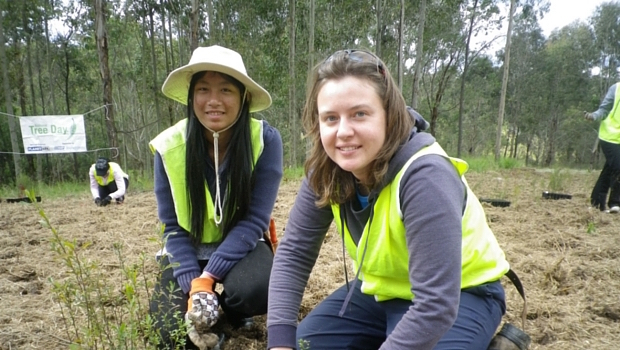 "Involving people as volunteers helps them to understand the importance of looking after our environment." Conservation Volunteers: Involving people as volunteers helps them to understand the importance of looking after our environment. We explain the conservation issues to them, and show them simple, effective actions that they can take to help improve the environment. This flows on into their everyday lives. If you join us as a volunteer and spend a day planting trees by a river, you’ll have made a great contribution by that alone. More than that, you’ll also start to understand the impacts of weeds, erosion, discharges into waterways – and perhaps additional issues like litter or reduced water in the system. "You can help even further by passing your knowledge on to the other volunteers! It’s all about getting people involved, understanding and acting together to solve environmental problems together – and enjoying themselves while doing it." And if you’re already aware of all those things (lots of volunteers are), you can help even further by passing your knowledge on to the other volunteers! It’s all about getting people involved, understanding and acting together to solve environmental problems together – and enjoying themselves while doing it. To explore Australia and join a conservation effort visit our program page, or connect with an advisor by sending us an email.